Put your table on the Best Dressed List! 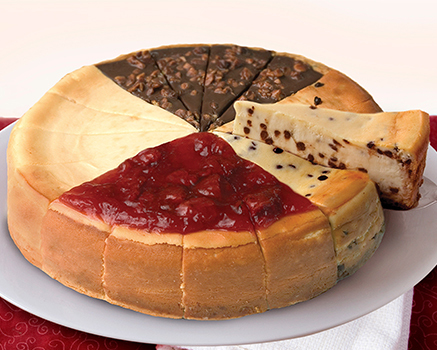 7 slices each of our Hot Chocolate Cheesecake and Double Chocolate Cheesecake made with Ghirardelli® Chocolate. 9", pre-cut, Serves 14. INGREDIENTS: Cream Cheese (Pasteurized Milk and Cream, Cheese Culture, Salt, Carob Bean Gum, Guar Gum), Whipping Cream (Cream, Carrageenan), Sugar, Egg, Milk Chocolate (Sugar, Milk, Cocoa Butter, Unsweetened Chocolate, Sunflower Lecithin [Emulsifier] and Vanilla), Powdered Sugar (Sugar, Corn Starch), Chocolate Chips (Sugar, Chocolate, Cocoa Butter, Butterfat [Milk], Vanilla and Salt), Semisweet Chocolate (Sugar, Chocolate Liquor, Cocoa Butter, Butter Oil (Milk), Soy Lecithin (Emulsifier), Natural Vanilla), Butter (Cream, Salt), Cocoa Processed with Alkali, Invert Syrup, Egg Whites, Tapioca Dextrin, Water, Chocolate Processed with Alkali, Nonfat Milk, Modified Corn Starch, Chocolate Coating (Sugar, Chocolate, Cocoa Butter, Butterfat, Vanilla, Artificial Flavor, Salt), Soy Lecithin (Releasing agent), Bittersweet Chocolate (Chocolate, Sugar, Chocolate Processed with Alkali, Butterfat [Milk], Vanilla and Soy Lecithin as Emulsifier), Salt, Xanthan Gum, Vanilla Extract, Natural Bourbon Vanilla Flavor (Vanilla Extracts and other Natural Extracts, Water Glycerin, Cane Alcohol, Sugar Syrup, and other Natural Flavors). INGREDIENTS: Cream Cheese (Pasteurized Milk and Cream, Cheese Culture, Salt, Carob Bean Gum, Guar Gum), Sugar, Ghirardelli® Chocolate [Unsweetened Chocolate, Sugar, Cocoa Butter, Milkfat, Soy Lecithin (Emulsifier), Vanilla], Whipping Cream (Cream, Carrageenan), Egg, Butter (Cream, Salt), Wheat Flour, Ghirardelli® Sunrise Cocoa (Processed with Alkali), Sour Cream (Cultured Nonfat Milk and Cream, Corn Starch, Whey, Guar Gum, Carrageenan, Carob Bean Gum, Enzymes), Water, Modified Corn Starch, Vanilla Extract, Xanthan Gum, Soybean Oil, Soy Lecithin.